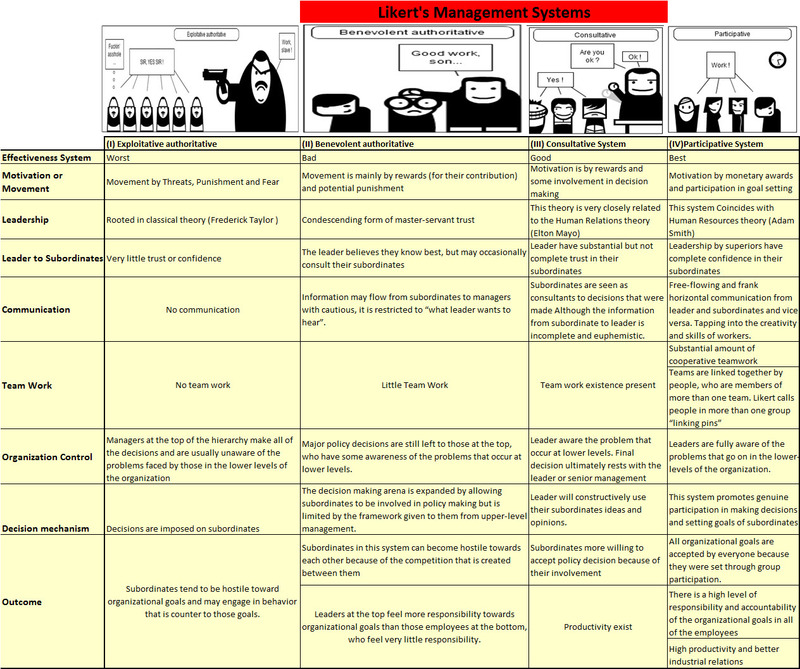 Likert’s Management Systems are management styles developed by Rensis Likert in the 1960s. He outlined four systems of management to describe the relationship, involvement, and roles of managers and subordinates in industrial settings as shown in Figure 1. This entry was posted in Volunteer_Delano and tagged Likert, management system. Bookmark the permalink. Awesome job pak Delano!!! Really well done!!! Thank You Dr. PDG It was summarized from 5 references to build one picture :). My motivation is to do this for one time only and when I need this knowledge in future I just look at our mercure blog which is stored in internet cloud which make it portable and convenient to see.